Some of the most common injuries suffered by bikers involved in a North Carolina motorcycle accident are broken bones, especially breaks to the knee (patella), and lower leg (tibia or fibula), as well as femur, arm, shoulder, ribs and ankle. Suffering a broken bone is a common childhood injury that normally heals without complication, but as we age, our bones become more brittle and more susceptible to more complicated breaks than a young person. The NC motorcycle accident lawyers at Auger and Auger have been helping motorcyclists recover from crash-related injuries since 1989. If you have been involved in a motorcycle accident that resulted in broken bones, you already know how painful it can be and can result in lifestyle changes. When fractures are severe, you can be left with permanent disabilities. It is imperative that you hire a law firm that is knowledgeable of the injuries suffered by bikers. When a bone breaks, it can be a displaced fracture, where the parts are not in alignment; non-displaced, where the bone is broken but remains in alignment; or comminuted, in which there are several pieces. Fractures are further classified as open, in which the bone comes through the skin, or closed. There are several ways of classifying a broken bone. When a bone breaks and is not in alignment, or the pieces have shifted, it is said to be a displaced fracture. A non-displaced fracture is one in which the bone is broken but the ends are in anatomical alignment. When a bone breaks and there are multiple pieces, or fragments, it is called a comminuted fracture. In an open fracture, also called a compound fracture, the bone comes through the skin. In a closed fracture, the bone does not break through the skin. The type of fracture will determine the treatment. In a non-displaced fracture, the fracture may be stabilized with the use of a splint or a cast. A displaced fracture that cannot be reduced by physical manipulation may require a surgical procedure to align the pieces, often using metal plates and screws to secure the fixation. With both types of fractures, physical therapy may be necessary. The treatment of a fracture is costly. At a minimum, there will be bills from the hospital, emergency room doctor, radiologist, and any supplies such as crutches, immobilizer, or splint. A more serious fracture may result in bills for surgical costs, prolonged hospitalization, and rehabilitation. You may also have to use medical devices, such as crutches, walker, or a wheelchair. If you are unable to regain complete functionality of your injured body part, you may be required to undergo vocational rehabilitation, or may even be totally disabled and not able to return to work. The NC motorcycle accident attorneys at Auger & Auger have more than 40 years of combined experience representing victims of motorcycle accidents across the state. We strongly recommend that you do not speak with any insurance companies until after you speak with an experienced lawyer. 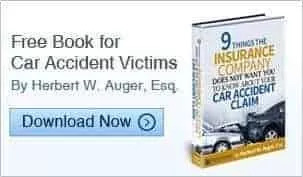 The law in North Carolina states that if you were partially at fault or contributed in any way toward causing the accident, you will be prevented from recovering damages from the other party. The insurance company will try to speak to you shortly after the accident, during a time when you may be vulnerable and not know the extent of your injuries. They may get you to twist your words or minimize your injuries. The sooner you call a motorcycle accident lawyer, the sooner an investigation on your behalf can be conducted.